Catch the next All This Jazz, starting at 9pm on Saturday the 15th, right here on KWGS / Public Radio Tulsa. Every Saturday night, both online and over the air, ATJ delivers three hours of recent and classic jazz, across a wide range of styles, from 9 o'clock till midnight. From John Coltrane to John Zorn, Chris Connor to Kris Davis, Bill Holman to Bill Frisell, and Gerry Mulligan to Geri Allen, All This Jazz is delighted by modern (and post-modern!) jazz in its many forms, and we love sharing the same with our listeners. 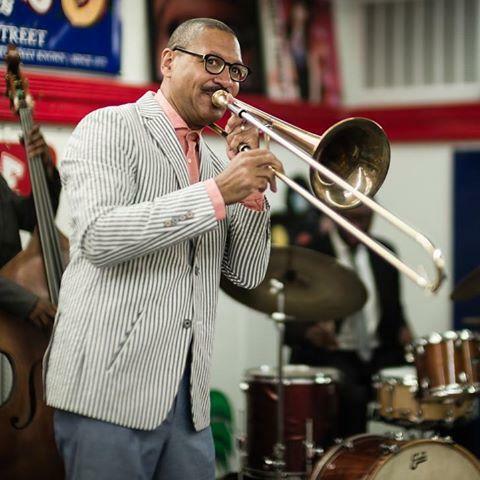 Our forthcoming broadcast will feature music by the the likable likes of Delfeayo Marsalis (shown here), Artie Shaw, James Carter, Claudia Acuna, Enrico Rava, The Bad Plus, Blue Mitchell, and Dewey Redman, among others. Also, please note that ATJ playlist info can be found here, at the bottom of the page...and that we (more or less) maintain a Facebook page for our show. Thanks.